The Pocket Operators: like calculators, but more fun. NAMM 2015: This year's NAMM show is notable not only for the number of new synths being launched, but also their variety. So, while Dave Smith is in one corner showing off his luxurious new Prophet-6, Teenage Engineering is in another with tiny rhythm, bassline and melody synths in its pockets. Produced, rather bizarrely, in collaboration with clothing retailer Cheap Monday, the suitably-named Pocket Operators are very much bare-bones devices. Each one is basically just a circuit board with a screen at the top and a couple of AA batteries and a stand strapped to the back. You'll also find a built-in speaker and audio out/sync connections. In terms of sonic specs, the PO-12 blends synthesized and sampled drum sounds, while the PO-14 and PO-16 feature FM, subtractive, wavetable and physical modelling synthesis methods. All the models come with effects and sequencing capabilities and - crucially - sport a built-in alarm clock. There are also some intriguing workflow options. Using the punch-in play styles on the PO-14 and PO-16, for example, you can minimise the effort involved in sequencing notes by just entering a few of them and then using the punch-in melody variations to follow these notes. 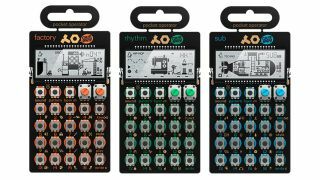 We're definitely keen to get our hands on the Pocket Operators and find out more. At $59 each, they're eminently affordable, but the early whispers are that they're far more than mere hipster toys (though they'll probably become those as well). You can take a closer look on the Teenage Engineering website.